Rejuvenite has changed the name on this model to "Low Profile Classic" and it's no longer branded "Renewal". It has a softer, low profile feel for stomach and smaller back sleepers. It also does well with children. (They find its plush feel very comforting late at night.) Try it and you’ll notice that it conforms to the way your head and neck rest, providing you with the proper orthopedic support. Its goal is to keep you from tossing and turning so much at night, so you wake up refreshed. Like so many Rejuevinite pillows, it's made from resilient Talalay latex with a unique pinhole design and open cell structure. This is what makes it unique, giving you enhanced air circulation and superior pressure relief. (This all adds up to better sleep and more energy in the morning). 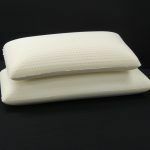 Latex pillows are considered a personal item and are NON-RETURNABLE!